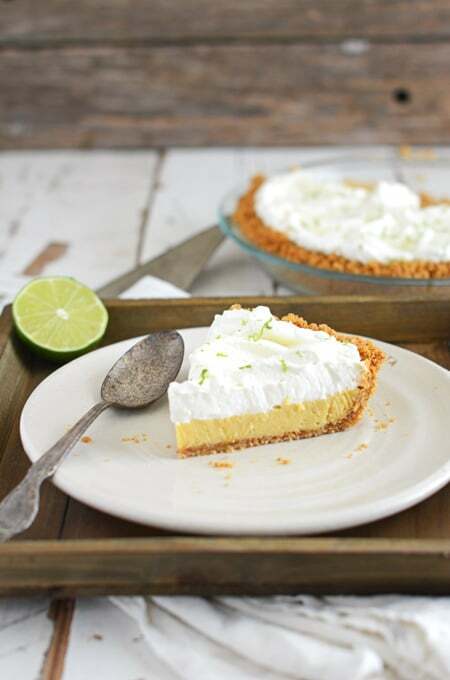 Leave it to Cook’s Illustrated to have the perfect Key Lime Pie recipe! When it comes to classic recipes I love digging through my favorite cookbook Cook’s Illustrated . I like to see the “why’s” and the “how’s” on how certain recipes work. Doing this has helped my cooking and baking skills tremendously. Trust me when you find out why vodka makes the perfect pie dough, and how an apple and tapioca can create the perfect blueberry pie filling, you’ll want to learn more about how and why things work in a recipe. 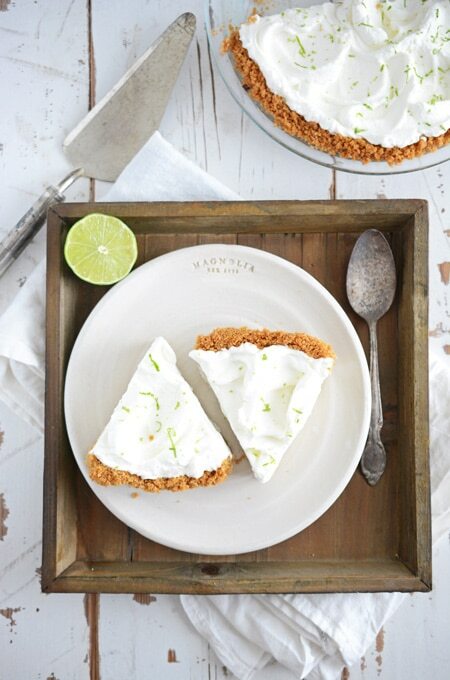 Yes this is a recipe for Key Lime Pie, and no you do not have to use Key limes. Key limes are usually not easy to find and Persian limes are readily available at your grocery store. (Those are the limes you see everyday there.) Plus most people will not be able to tell the difference in taste anyway. 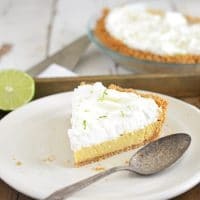 If you do happen to find Key limes use them, but just know you’ll need about 20 Key limes to get the amount of juice needed for this recipe. And don’t you dare use that bottled lime juice! You’ll come out with a pie that tastes rancid and bitter! 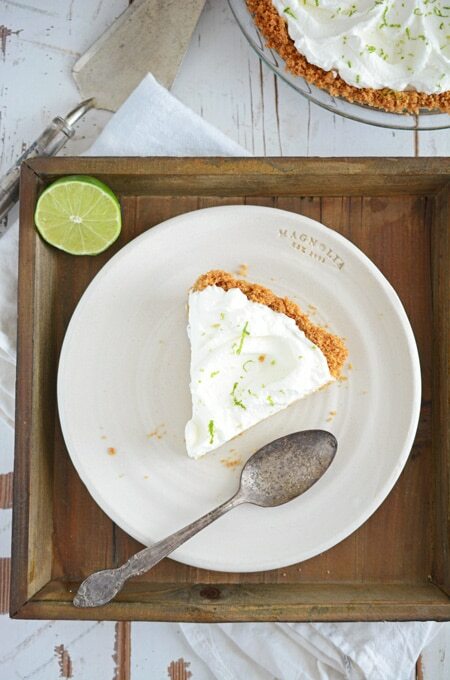 This Key Lime Pie is a little different than most. You’ll need to bake this filling as well as make it first, before the graham cracker pie crust. The pie crust must still be warm when the filling is poured in. And just say no to that box of graham cracker crumbs. Those tend to yield stale cracker crumbs and that’s just not good eats. Here are a few other recipes like this I think you might enjoy: Chocolate Cream Pie, Blueberry Pie, and Pecan Pie. Don’t forget to follow The Cake Chica on social media: Facebook, Instagram, Twitter, Pinterest and Yummly. In a medium bowl, whisk together the egg yolks and lime zest. Continue whisking for about 2 minutes. Whisk in sweetened condensed milk until smooth. Add lime juice and whisk until combined. Cover mixture and set aside at room temperature for 30 minutes until thickened. While the filling thickens, adjust an oven rack to the middle position and preheat oven to 325 degrees. Process graham crackers in a food processor to fine crumbs, about 30 seconds. Sprinkle melted butter and sugar over crumbs and pulse to combine, about 5 pulses. Pour mixture into a 9-inch plate. 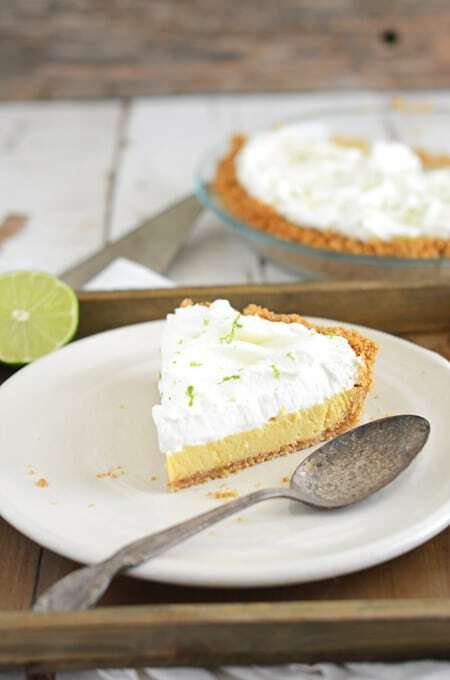 Using the bottom of a measuring cup, press the crumbs into an even layer on the bottom and sides of the pie plate. Bake until the crust is fragrant and starts to brown, about 13 to 18 minutes. Pour thickened filling into the warm pie crust. Bake the pie until the center is firm but jiggles slightly when shaken, about 15 to 20 minutes. Let pie cool slightly on a wire rack for about 1 hour. Cover loosely with plastic wrap and refrigerate until the filling is chilled and set, about 3 hours. Using a mixer fitted with the whisk attachment, whip heavy cream and sugar on medium-low speed until foamy, about 1 minute. Increase speed to high and whip until soft peaks form, about 1 to 3 minutes. 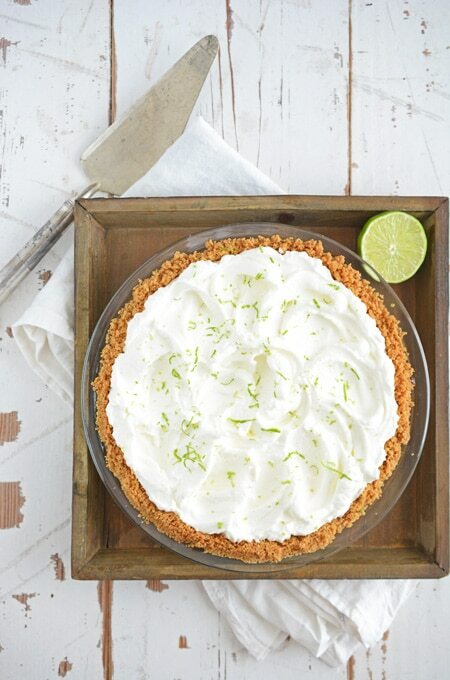 Spread topping over pie in a decorative pattern and enjoy.